Magnus Lindberg (b. 1958) is among the most important European contemporary voices in classical music. 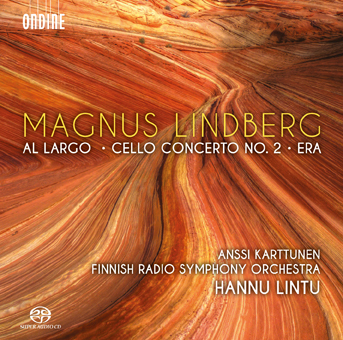 This recording includes some of Lindberg’s most recent orchestral works written during and after his composer-in-residence years with the New York Philharmonic Orchestra (2009–12). Lindberg is continuing as the composer-in-residence with the London Philharmonic Orchestra 2014–17. This recording includes Cello Concerto No. 2 performed by Anssi Karttunen as the soloist and two orchestral works performed by the Finnish Radio Symphony Orchestra and conducted by its chief-conductor Hannu Lintu. Al largo is an extensive work with a duration of over 20 minutes written and dedicated for the New York Philharmonic Orchestra and Alan Gilbert. Despite of its title Lindberg himself considers it as the fastest music he has ever written. The title suggest that under the busy surface a large structure is slowly shaping itself. Cello Concerto No. 2 was commissioned by the Los Angeles Philharmonic. The Concerto is re-written, orchestrated and extended version of a chamber work, Santa Fe Project (Konzerstück), which was written in 2006. The Cello Concerto was premiered by Anssi Karttunen, who also plays as soloist in this premiere recording of the work. The final work on the disc, Era, was commissioned by the Amsterdam Concertgebouw Orchestra for its 125th Anniversary in 2013. This work was inspired by the music written during a golden age in music in Europe, just before the outbreak of World War I. The work evolves towards opulent sonorities and bold culminations. The work, also receiving here its premiere recording, has been described as a tone poem, even though it has no narrative content.